Another second for Fleeting Visit! Eve Johnson Houghton and her team are on fire! Yesterday they had What About Carlo win at Newbury, Fleeting Visit 2nd at Ripon and Cool Bahamian 2nd at Newmarket. What a day! Congratulations to all connections. Lovely to see Romp’s 4 year old half brother Fleeting Visit (Manduro) placing again, his third in a row! From 13 runs he has placed 7 times and won as a 2 year old. Currently on a rating of 84. Consistent horse! Autumn Leaves just pipped at the post! Elkington Stud Bred 2 year old Autumn Leaves (Jadwiga x Helmet) was quite literally beaten by a nostril today at Newbury. More to come from this Clive Cox trained filly. Cee Jay (Intermission x Kyllachy) gets his head in front to win at Brighton under Charlie Bennett for trainer Patrick Chamings. Congratulations to all connections. RIP gets his first black type win! 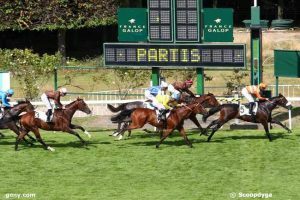 3 year old RIP (Rip Van Winkle x Kylayne) wins the Prix De Saint-Patrick (Listed)! Born and raised at Haras du Cadran. RIP’s dam Kylayne is a black type full sister to Elkington Stud’s Glee Club. Jadwiga’s 2 year old half sister Briateke (Dabirsim) adds some black type to the page when coming 2nd in the Premio Luciano Mantovani (Listed) on only her second run! Congratulations to all connections.